I first became familiar with Jo Tannah’s writing when we were both publishing with Wayward Ink, an LGBT Press that is sadly now defunct. But Jo quickly picked herself up from the press’s closure and found new homes for her romance novels. I was thrilled when Jo told me last month that she wanted to participate in Books Save Lives with two titles — including one that she’d previously published with Wayward Ink, The Way You Look Tonight. Books Save Lives is a project of Readers & Writers for LGBT Chechens that raises funds for the Russian LGBT Network and other charities helping gay men escape Chechnya, where police are currently conducting a campaign of terror against anyone they suspect of being gay. Jo’s two titles in Books Save Lives are part of The Standards, a series of novellas inspired by popular jazz hits from the mid-20th century. She has generously offered to send the proceeds from her sales of The Way You Look Tonight and What A Difference A Day Makes on Sea to Sky Books to the Russian LGBT Network through the end of May. I enjoyed The Way You Look Tonight when it first came out and was glad to see it available again. It’s a contemporary May-December gay romance between two doctors in West Virginia. Below is an interview I did with Jo last February when it first came out. Today I’m welcoming Jo Tannah, author of The Way You Look Tonight, to my blog. This novella movingly explores both family ties and a romantic relationship that crosses cultural and generational lines. Jaime “Jamie” Abello’s life plan had seemed so simple: pass the Philippines Medical Board Exam, practice in the family-owned hospital, join the hospital’s board by age forty, and find a life partner. Instead, an insurance scandal hits the family hospital, and Jamie gets shipped off to the United States while his father tries to clear the family’s good name. As Jamie settles in at a pediatric residency program in West Virginia, he finds distraction from his family stresses in the form of Miles Kwon, the handsome and principled director of the residency program. When an unfounded malpractice lawsuit threatens Jamie’s immigration status, Miles takes the bat for him. And when tragedy strikes Jamie’s family, Miles is again there, helping him work through his pain. Can Jamie turn this thing between him and MIles into a lasting relationship, or will his family’s secrets cause him to lose everything he’s gained? 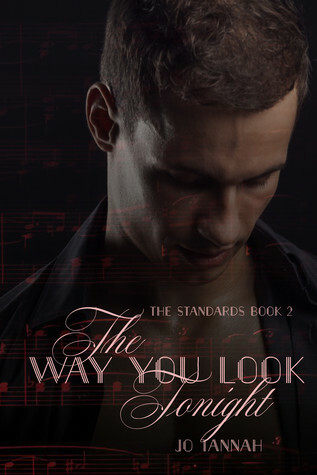 The Way You Look Tonight is the second book in your Standards Series. Can you tell me more about the series and the inspiration behind it? I found out that not everyone is familiar with the term “The Standards,” but many are familiar with the songs. “What A Difference A Day Makes,” “Summertime,” “The Way You Look Tonight,” “My Way”—these are just some of the titles that immediately come to mind. I have been listening to these songs all my life, and the lyrics strike me as especially poignant and romantic. My series uses the lyrics to set the plot of the particular story. As for the men, these books focus on May/December romances. I have released one other, What A Difference A Day Makes (update 5/24/2017: Use this Sea to Sky link for proceeds to go to the Russian LGBT Network). It came out two years ago and is the story of how one day, 24 little hours, can make a change in someone’s life. The Way You Look Tonight is based on the lyrics of the song that shares its title. I challenge readers to spot the lyrics of the song in the book. They’re there, all over the place. Some reworded, but if you know the lyrics, you’ll spot them! Your main character, Jaime “Jamie” Abello, is a Filipino working in the United States as a medical doctor. How much of his story reflects your personal experience? Oh, I should say quite a lot of things that went on in Jamie’s life are what I experienced, or I know personally someone who did. The walnuts, the deer, and the ER scenes are all me. Jamie and his love interest, Miles Kwon, come from different cultural backgrounds and have an age gap between them. They also have different temperaments, with Jamie being more outgoing and goofy and Miles quite reserved. Can you talk about your inspiration in creating these characters and their dynamic relationship? I love May/December romances. I know a few couples and have seen firsthand how beautiful their relationships can be. Of how the older partner has the patience to guide their younger lover but at the same time are guided by them as well. It’s kind of like yin and yang, where the negative of one can be balanced by the positive of the other. On a personal note, I have connections to Korea and Japan through my family background, so my interest was piqued by Miles’ affinity for Japanese art and gardening. This is opposite of the usual stereotype of Koreans eschewing everything Japanese. I was wondering if you have a backstory for his interest. This is a very insightful question. My first reaction was “…and vice versa!” I come from a city where Japanese and Korean students come in droves to take advantage of the affordable education. My city has several universities that offer the best education outside of Japan and Korea. Although I agree the general assumption is these two cultures and peoples clash noisily, I can honestly attest to them not clashing as much as most of us are led to believe. In fact, I have witnessed firsthand how these students become lifelong friends. The art in the story, the one Jaime saw in Mile’s office, I am staring at it now. It is hand embroidery depicting the sea, islands, birds, and flowering trees. My grandmother got it for her wedding anniversary way back in 1928. The Japanese garden is a dream of mine, and I have forever longed to have one but never could because of my dogs. That goes for the koi as well. I had fish, but they didn’t quite survive the tsunami my then-shepherd created every time she chose to dip her feet in the pond. Can readers expect more books in the Standards Series and/or about Jaime and Miles? For sure there are more of the Standards series in the works. I’ve drafted one called “Summertime” and another, “Strangers In The Night.” Sad to say, I have no idea when I’ll finish them. As for Jaime and Miles, hmmm… you’re the second one who’s asked me that. I’ll see! Quite a few upcoming projects are in the works. I am currently working on the edits of a paranormal story based on local myth and legends. Hidden: Evils is contracted under Wayward Ink Publishing just like The Way You Look Tonight is. Then I have another about to be released in March by Extasy Books. The only thing I can reveal right now is that it’s science fiction. The others are still on the finishing stages before submissions, which I hope to do some time soon. Hopefully, earlier. Thank you again for having me here. It’s a strange but happy experience to be at this end of a blog tour! Through May 31, proceeds from purchases of The Way You Look Tonight on Sea to Sky Books go to the Russian LGBT Network. JO TANNAH is a wife, mother, and blogger by day, writer by night. It can be difficult to say the least, but it is a challenge that keeps her on her toes. She grew up listening to folktales her father and nannies spun to either entertain the children or send home a message. These narratives stayed with Jo until she finally decided to write them down in a journal way back when she kept one. Years later, going through junk led to finding a long forgotten box, and nestled within it was the journal. Reading over the stories of romance, science fiction, and horror that she had taken time to put to paper all those years before brought to light the realization that they were tales she’d never come across in her readings.